News – Pook & Pook Inc. This week I chose something that meets some of my must have criteria for me to consider it to be a great antique. Some of those benchmarks for me include scarcity, size, color, surface and eye appeal. It’s a forgone conclusion that everything that makes something a pick of the week has eye appeal. If it is hard to look at, no one would pick it. Anyone of us who has dealt with antiques for more than a day has the stories of something that was really ugly. That giant moose of a desk, the painting that makes you gasp, the piece that totally falls apart from just a mere glance of your eye. So, for me the eye appeal comes first, then it has to meet a second point. My pick this week checks off two more of the must have boxes, color and surface. Lot 246 in the May 4th, Americana sale has great color with a fantastic old dry surface. 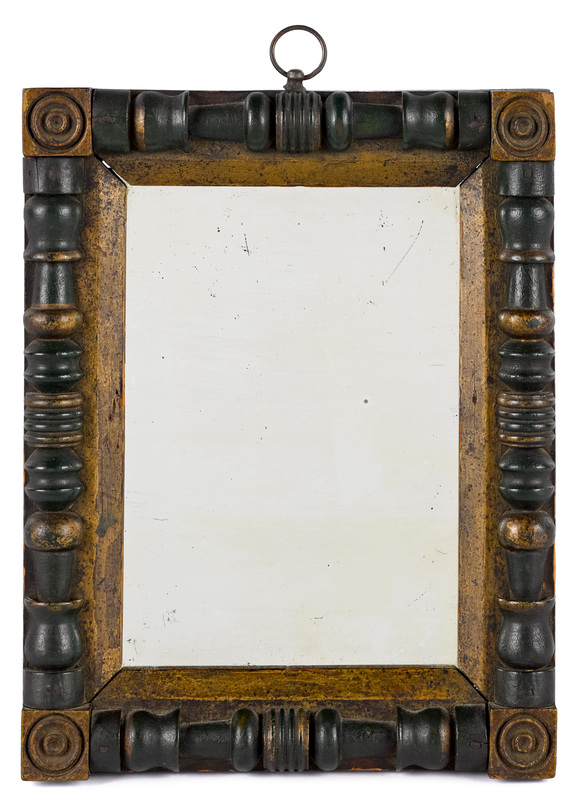 This Sheraton mirror retains the original green and gilt painted surface that just screams Americana. At 10” high and 7 ¾” wide it is very cute as a mirror but the frame begs to have a fantastic Pennsylvania pen and ink fraktur hanging inside. So, mirror, mirror on the wall, who will buy you as one of the fairest of all. As the spring Americana sale is fast approaching, I wanted to get a pick of the week out there and share some spring inspiration. With over 400 lots I had plenty of things to chose from. The obvious choice and my true favorite is the cover lot – a Mahantongo Valley, Pennsylvania turned and painted spice box, which is over the top incredible. I am confident that this lot will get more than enough attention as an iconic piece of American folk art and will be the object of desire for many individuals. So, in saying that, I went with my second favorite lot of the sale. 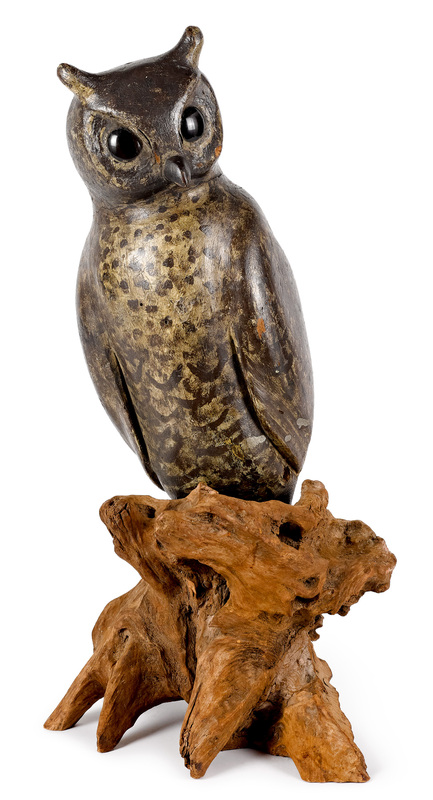 Lot #40 which is an exceptional carved and painted owl decoy. This owl dates from the 19th century and retains the original untouched painted surface. It is hollow carved with bright, bold eyes that are keenly looking for its next meal. At an impressive 25” high he can surely sit tall enough to scan the forest floor. For those of you who do not know, owl decoys were used in the hunting of crows. Owls and crows have an inherit disdain for each other. Crows will bombard perched and flying owls and owls have been known to prey on young crows. Mother nature’s version of the Hatfield’s and McCoy’s. No matter which side you are on, I think everyone can agree that this owl is one majestic specimen. He (I am assuming!) came to us from the legendary collection of Titus Geesey, an iconic name in the antique world. So, give a hoot and see if you can add this feathery friend to your collection. It very well may be difficult to call a gun a work of art but my pick this week is just that. Lot 16 of Pook and Pook Auctions firearms and military sale on April 13th, 2019, is certainly a graphic gun. 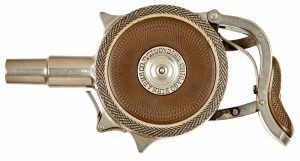 Its sleek lines designed to fit in the palm of the hand was patented and first built in France in 1882 by Jacques Turbiaux., nicknamed the “Turbiaux Disc Pistol”. In 1883 it was built in America and referred to as “The Protector” by Minneapolis Firearms Company. Peter Finnegan then bought the patent and founded the Chicago Fire Arms Co. in 1892. Approximately 15,000 were produced by the two American companies until 1910 when the company disbanded and sold the inventory. This was a great James Bond pistol long before James Bond. My pick for this week is strictly based on functionality. This lot, lot 86, comes to us from the Furnishings and Decorative Items of the Home and Offices of Dr. Albert and Laura Barnes, which will be sold at Pook and Pook’s auction house on March 15th, 2019 beginning at 6:00 PM. While I must admit this cupboard would be better with a nice old green or blue painted surface, the lack of paint is made up for by its usefulness. Made of solid cherry, the wood has its own beauty even without the paint. 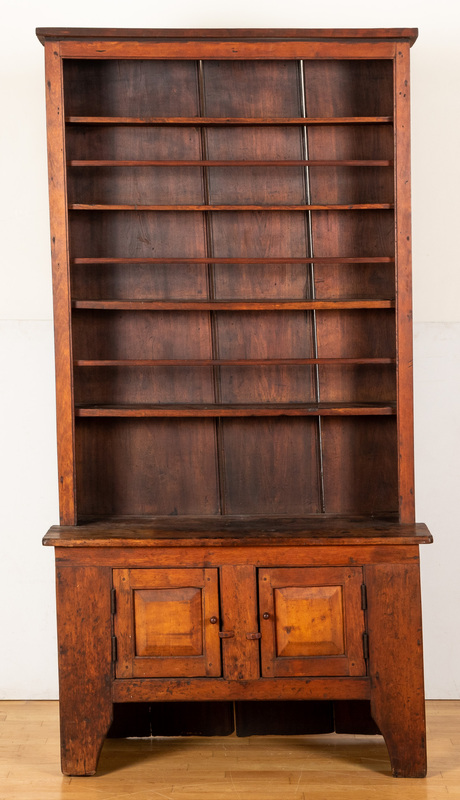 Imagine how many pieces of stoneware or redware would fit on the four shelves. 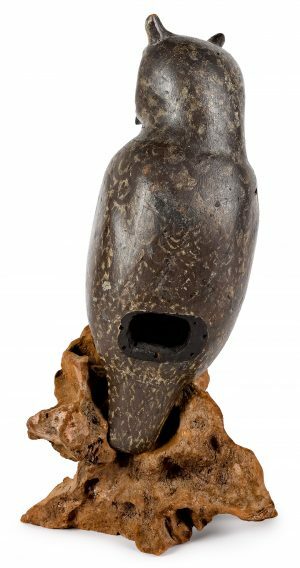 It is also primitive enough to hold a decoy collection or lighting collection. Its usefulness is in its ability to hold a large collection within the open top, so everyone can see the treasures within. The majority of space in this cupboard is open shelving while having two raised panel doors in the base. It has a tall cut-out foot raising it even higher to the ceiling. So, log in to Bidsquare and bid as high as you can and then let us know what collection you are going to keep in it. Or better yet, come out to see us in person and maybe buy the cupboard as well as a few other treasures. This lot will be sold Friday evening. Don’t miss out! This pick is from our spring online only toy auction which is being held on Saturday, February 9th, 2019 beginning at 9 AM EST. 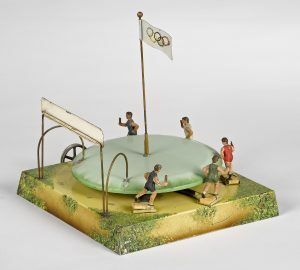 The showcases and tables here in Downingtown, Pennsylvania will be filled with a nice cross section of toys, from contemporary to folk art, tin wind-up to battery operated, there seems to be something for everyone. There is a very nice group of Japanese battery operated and friction toys from the Estate of Jonathan Barrow of Los Angeles, California. My pick this week flew in on the red eye from this unique collection. 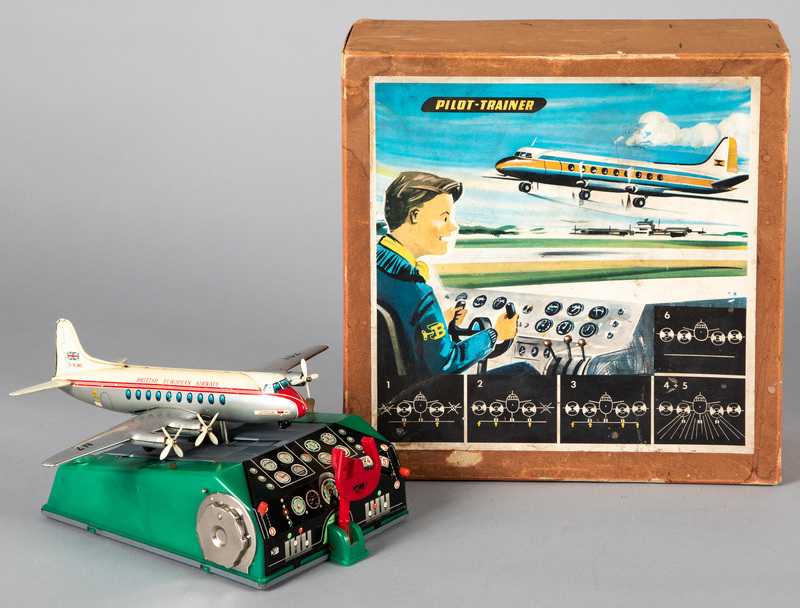 I picked lot #1183, a German pilot trainer which is a tin battery-operated toy. This British European Airways airplane sits on the runway which is on a continuous feed “treadmill”. Although the toy is currently not working it has been fun to raise and lower the plane and make noises. I have a nephew who is currently in the process of getting his pilot’s license. We were very proud when at 17 he did his first solo flight. I am wondering if this toy would give him more experience and get him in the friendly skies quicker? It certainly would be cheaper! I am stuck in a quandary once again. Trying to narrow down to one thing for this week’s pick. What a nice problem to have! I could easily select another fraktur, just look at lots 643 and 644 in our upcoming Americana sale if you need more inspiration. There is a fantastic pair of Philadelphia chairs, a schrank with a great old painted surface, tiger maple dressing tables (yes plural), portraits, stoneware, and the hits keep coming. I start with a list of about twenty items and start comparing which ones I like better, so my twenty is paired down to ten which becomes five until I finally decide which is “The One”. This week for me I chose lot 338. When everyone comes for the preview this will be the guy who greets you at the door. 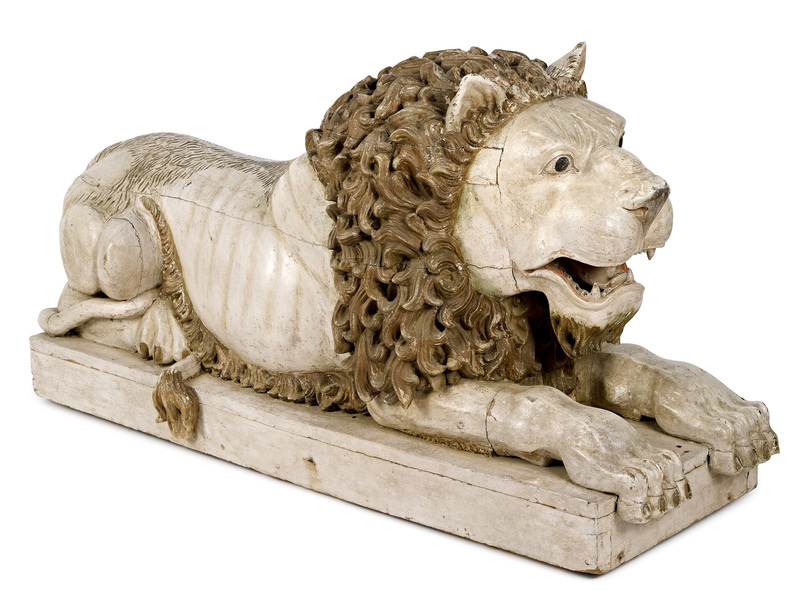 It is a massive carved and painted recumbent lion. Measuring an impressive 70” long as his paws and tail overhang his wooden platform. His open mouth seems to be talking as it shows off his pearly whites. The regal gilt mane shows a deft hand of a successful carver, the massive paws with a fresh pedicure beckon you in for a closer look. All painted in an old ivory surface with terrific wear. 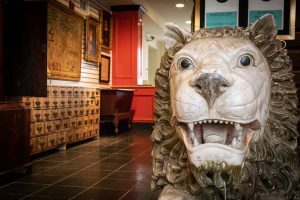 Will this lion be the King of the Pook and Pook auction on January 11th and 12th, 2019 or will some other magnificent example rule the land? Look again next week for another competitor to the throne of this exceptional auction. Christmas is now in the rear-view mirror. New Year’s Day is approaching faster than my dog from the end of the yard when I say the word treat. Not to mention the Pook and Pook January catalog auction is just around the corner. January 11th and 12th, 2019 over 750 lots will find new homes. Get a head start on next year’s Christmas shopping, spend the leftover money you have or even spend someone else’s money after making them feel guilty for not getting you that perfect antique gift. This sale has something for everyone. We have talked about the fraktur, we teased you with a few words of upcoming lots. There is so many great things. I searched and searched for my lot again this week. I really like the country living appeal of the apothecary cupboard, the surface on the pair of Philadelphia chairs is unbeatable, the rarity of the Philadelphia wing chair will garner a lot of attention. I went with lot 357 as this week’s most prominent. It combines several things that I love about antiques. One of those is its Pennsylvania origin, as a born and raised inhabitant of this great state, there is no wonder I love Pennsylvania antiques. The second is great paint, I have always gravitated to painted surfaces. For me, I prefer Pennsylvania painted pine and poplar over mahogany and walnut any day. 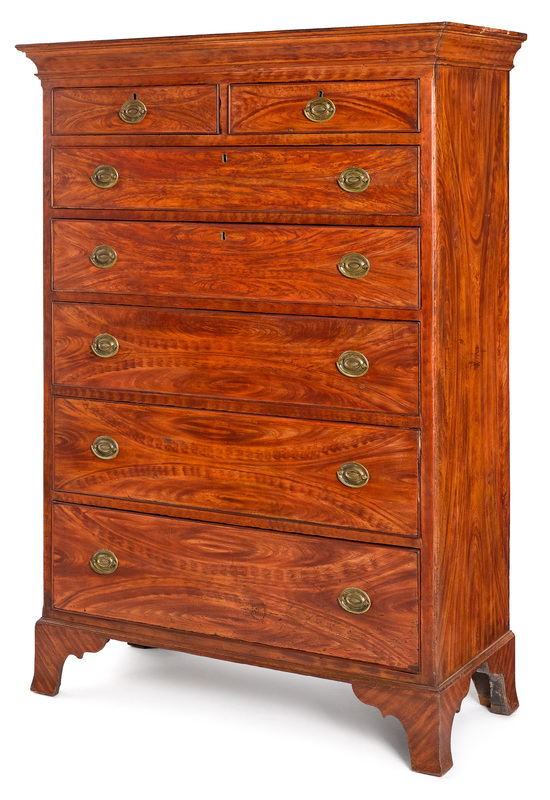 This painted pine tall chest has a warm, vibrant red grained surface which is better than if it had actually been the mahogany that they were trying to represent. The chest has split drawers over a full bank of five graduated drawers resting on bold bracket feet. There is plenty of storage for all of those new Christmas outfits you received. Don’t miss out on this one! I am giving advance notice that our upcoming January Americana and International auction on January 11th and 12th in Downingtown, Pennsylvania is an exceptional sale! There are several estates and collections featured including those of Kenneth and Elizabeth Johnson of York, PA, Edie and Bruce Smart of Upperville, VA, Bruce Fredericks of Colts Neck, N.J., the home of Titus Geesey of Wilmington, DE, just to name a few. Each collection provides a stand out item. The Johnson collection has a fabulous room size Heriz carpet, from the Smart collection is a great group of Pennsylvania long rifles which are always of interest to me, the Geesey collection submits a great line and berry Chester County spice chest, the Fredericks collection has two exceptional additions one is a pair of Philadelphia dining chairs in the best surface one could hope for as well as an important carved Philadelphia wing back chair that is sure to garner a lot of attention. 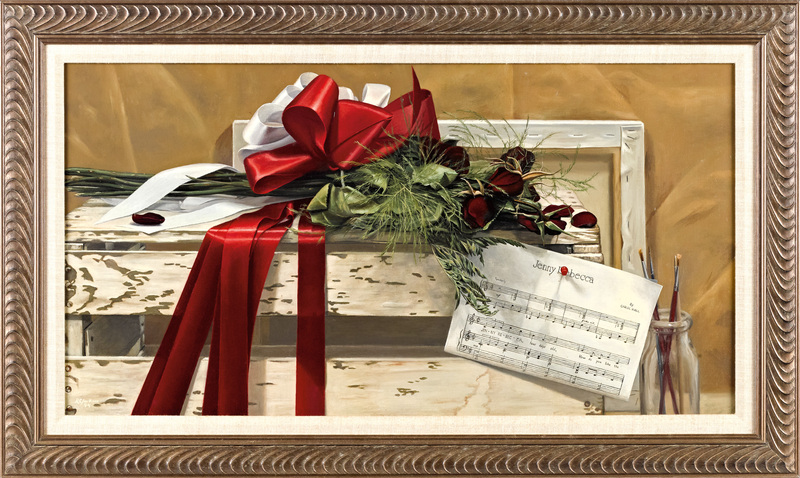 My pick however came from the estate of Charlene Sussel of Rockville Maryland. Most of us who have been around the antiques business for any amount of time recognize the Sussel name as one of those who belong on the Mount Rushmore of antique dealers. The estate is chocked full of fraktur and this is where my pick came from. I had difficulty just deciding on one. The fraktur artists’ names read like a who’s who: Petermann, Landes, Eyer, Zinck, Munch, Krebs and Young just to name a few. 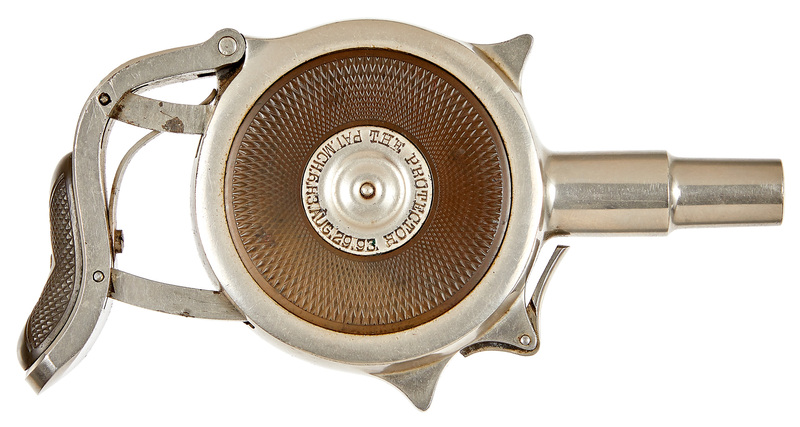 There is a terrific example attributed to the Ehre Vater Artist that was once part of the Himmelreich collection which last sold in May of 1973. I, however, chose one that for me has all the bells and whistles. This is one that we are not sure who made it but it is attributed to the Schwenkfelder’s. 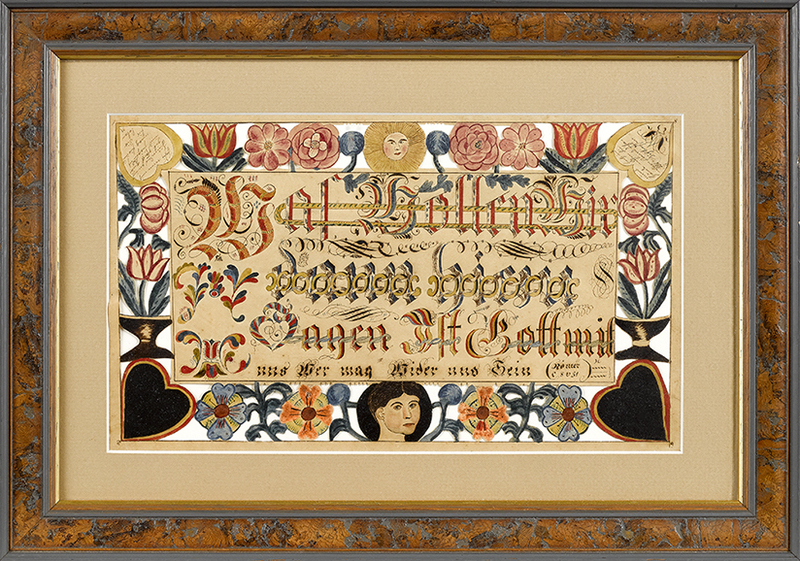 This fraktur scherenschnitte has a terrific border highlighted by a central portrait of a man along the bottom edge, hearts in the lower corners, potted tulips and roses throughout the edge all centering text. The top edge with an angel portrait that watches over the script. A similar unfinished example is in the Schwenkfelder Library collection. Search online on our website for fraktur and this one will certainly catch your eye. This week I wanted to choose one of the amazing steam toy accessories set to cross the auction block on Saturday, December 8th, 2018. I am trying to picture in my mind the grandiose layout with several large steam power plants intertwined with belts and pulleys, smoke belching from the chimney stacks and the room engulfed in motion. Everywhere you look something is spinning, churning, twirling all under a hypnotic buzz. Just keep the fires burning and the steam would drive them to run all day and night. I think every activity is represented, the farriers, blacksmiths, coal miners, knitters and even the gamblers have a member showing off their skills. The amusement park rides were just like the real ones, the Ferris wheel taking people to new heights, the swings causing hair to flow in the breeze, the horses on the carousels spinning around and around. Look over there at the whip as the riders scream from being tossed from side to side. That one kid doesn’t look so good. I think he is going to be sick. In the distance a man is playing a banjo on the entertainment stage, his foot tapping to the rhythm of the beat which changes my focus. This week I picked lot number 416 from the Steam Toy Collection of Morton Hirschberg. 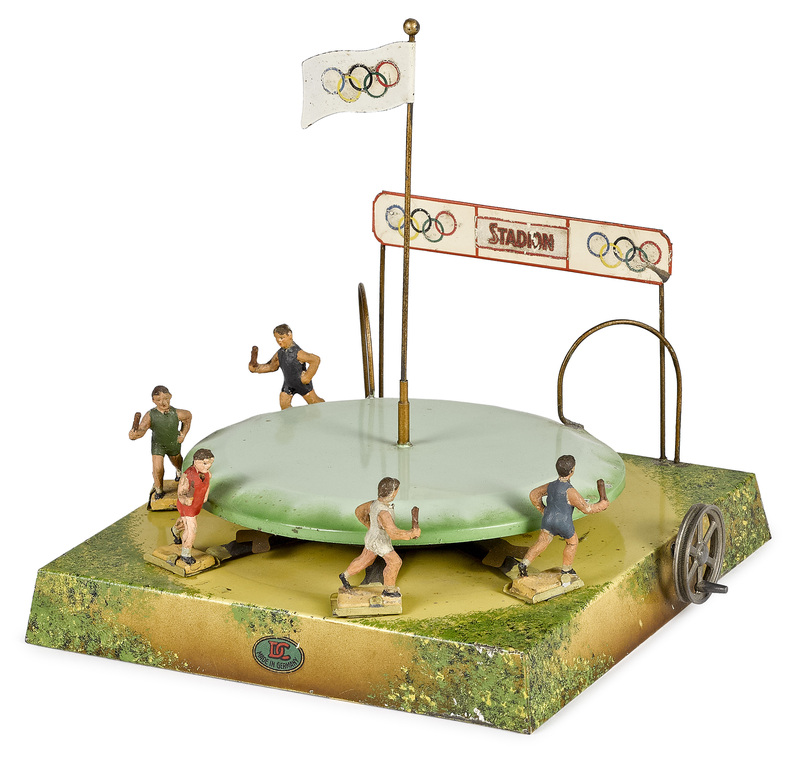 The painted tin Olympic relay race made by Doll exemplifies perfection in a steam toy of the early 20th century. The movement of five runners each holding a baton, which they stretch forward to the track star in front of them. The lead runner not taking off until the guy behind nears. The center with a flag pole hoisting the Olympic flag as a banner signifies the stadium in the background. Don’t have a steam toy power plant to drive the race? No problem, just turn the hand crank on the side and watch them run like the wind. This is yet another visionary toy with great action that sure beats any PlayStation game in my book. I once again am lacking promptness on my picks of the week. As the basement at Pook and Pook Auctions was being swamped in guns, toys, and antiques I found it nearly impossible to find time to address some of my favorite things set to cross the auction block. Now that I am almost recovered from too much turkey and stuffing, I have found something I need to show everyone. I must admit that if I had a pick of the past year this would certainly be in the running for my favorite! Keep in mind that this toy will be sold Friday evening, December 7th, 2018 so there is plenty of time to have it wrapped and under my Christmas tree. I wonder if 100 years ago some young child ran down the steps to find this as his gift. The excitement and awe transcend the century since it was made. This pick is lot 188, the HMS Franklin automaton. Franklin’s lost expedition was a British voyage led by Sir John Franklin in 1845 aboard two ships, the HMS Erebus and the HMS Terror. The ships became ice locked in the Canadian Arctic waters and all lives were tragically lost. In 2014 the HMS Erebus wreckage was finally located and two years later the HMS Terror was found as well. Imagine being a young sailor and getting assigned to serve on a ship named the “Terror”! 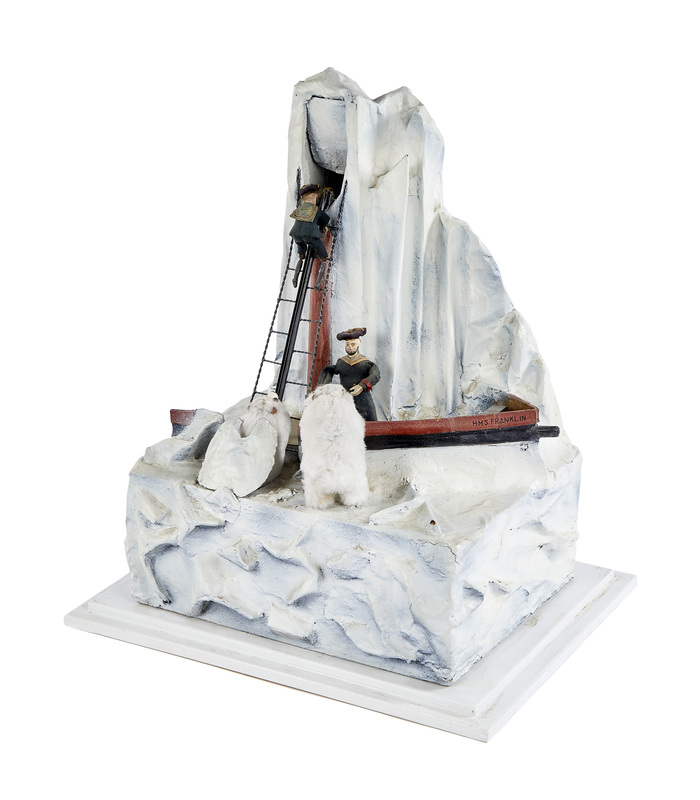 This toy features a clockwork mechanism with a fantastic animation of a sailor scurrying up wire rigging as a polar bear emerges from below to chase at his heels. 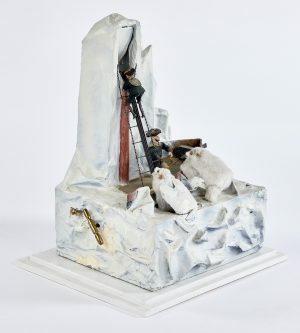 The sailor reaches the top where he disappears into the façade of a towering iceberg. The bear hot on his heel’s dives into the cavern with reckless abandon. There is brief delay as you wonder the fate of the young man. Did he escape, did he manage to kill the bear, what happened? Just as all hope fades, he reemerges from a trap door in the ice below only to hastily make his getaway once again. Off to the side of the bow of the ship is an older sailor wielding an axe as he swings aimlessly at a second menacing polar bear. The toy still works smoothly and the bear will chase the poor middy all day long. I am amazed by the complexity and vision of the maker so very long ago. Don’t forget that I have been very good this year and I have a spot saved under my tree!